The post Why Do Dogs Chew Their Feet? Reasons Why and What to Do by Martha M. Everett appeared first on Dogster. Copying over entire articles infringes on copyright laws. You may not be aware of it, but all of these articles were assigned, contracted and paid for, so they aren’t considered public domain. However, we appreciate that you like the article and would love it if you continued sharing just the first paragraph of an article, then linking out to the rest of the piece on Dogster.com. Chewing and licking feet are common behaviors. “Just because a dog is licking his foot doesn’t necessarily mean that he needs to be rushed into the vet clinic,” Dr. Pachel says. But if the behaviors come on suddenly and intensely for extended periods, they can be cause for concern. Why do dogs chew their feet? Allergies might be at play. Why do dogs chew their feet? Allergies might be the answer. Photography ©Barrie Harwood / Alamy Stock Photo. One of the common answers to, “Why do dogs chew their feet?” Allergies. If the behavior coincides with a change of seasons, that offers a clue that an environmental allergen, such as pollen, mold or mildew, might be triggering the behavior. More long-term chewing could signal a food allergy. But determining the exact food ingredient is difficult and time consuming. “It is a process of trial and error, and it’s impossible to predict just by looking at the dog just what they are allergic to,” Dr. Pachel says. A 12-week food-elimination trial offers the best chance of finding a specific culprit, says Rebecca Remillard, PhD, DVM, a diplomate of the American College of Veterinary Nutrition. These involved trials start with feeding a simplified diet of foods the dog has never eaten. Why do dogs chew their feet? Due to these diseases and illnesses. 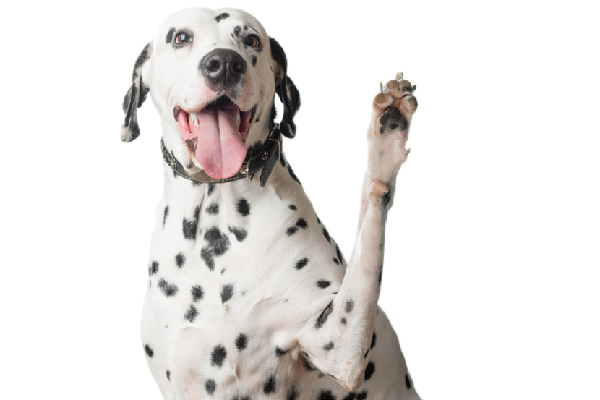 So, what are some other common answers to, “Why do dogs chew their feet?” Numerous between-the-toes skin diseases can cause a dog to chew his feet, says Dr. Remillard, who founded Veterinary Nutritional Consultations Inc. in Hollister, North Carolina. In addition, injury or pain (such as from arthritis or hip dysplasia), as well as autoimmune diseases, cysts, tumors and cancer can lead to foot biting. Some dogs might munch their digits due to skin infections caused by hormonal imbalances, namely too much cortisol or too little thyroid hormone. Something as innocuous as dry skin from winter weather, an arid climate or a deficiency of fatty acids in the diet can cause excessive paw chomping. A cracked claw could be to blame or even a corn (Greyhounds are said to be prone to corns). Maybe a thorn, pebble or other foreign object is lodged in or between the paw pads. Fleas, ticks, mites and other parasites irritate the skin, as can some soaps and shampoos, the salt used to treat snowy streets and chemical substances such as harsh lawn and garden pesticides. Why do dogs chew their feet? Is there ever a good reason behind it? Sometimes the answer to, “Why do dogs chew their feet?” is even beneficial. When dogs instinctively lick their wounds (whether on the foot or elsewhere), antibacterial enzymes in their saliva help ward off infection, according to an article on Psychology Today’s website. Saliva also aids in cleaning abrasions and cuts, and the licking action promotes healing by stimulating cells that close the wound. What’s the difference between a dog chewing and a dog licking his feet? Photography ©PakHong | Getty Images. Now that we’ve got some answers to,”Why do dogs chew their feet?” let’s look at some reasons why dogs lick their feet. Licking without chewing is often a behavioral issue, says Dr. Pachel, who is a diplomate of the American College of Veterinary Behaviorists. Licking feet can be a sign of anxiety, depression, stress, boredom or canine compulsive disorder, which affects as much as 3 percent of dogs. “Something about that repetitive oral behavior may be a stress relief,” says Dr. Pachel, who likens it to people chewing their fingernails. It also can be an attention-seeking behavior. “We could have a dog that is licking or paying attention to his feet because that is a behavior that drives the owner crazy,” Dr. Pachel says. Reacting to the licking can inadvertently reinforce it. If your veterinarian rules out health issues as the cause of licking, consult an animal behaviorist. Whatever the answer to the question, “Why do dogs chew their feet?” is — foot chewing and licking in and of themselves can cause problems. “Chewing and licking can disrupt the normal skin barrier and the normal skin defenses,” Dr. Pachel says. Dampness from saliva can lead to yeast and bacterial infections, particularly for dogs with thick fur that retains moisture. And repeated friction from a rough tongue can rub off fur and cause acute moist dermatitis (hot spots) and lick granulomas (skin lesions). 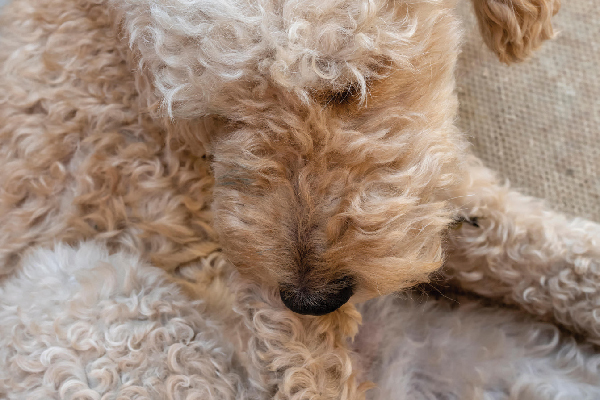 What initially might have offered temporary relief to the dog ends up making things worse, requiring a multi-pronged resolution: Breaking the itch cycle with antihistamines, topical creams or lotions; treating any infections; and eliminating the underlying cause. The short answer to “Why do dogs chew their feet?” It’s complicated. But just as there are lots of causes, there also are lots of treatments. Are there ways to nip dog foot chewing before it begins? Photography ©kyolshin | Getty Images. 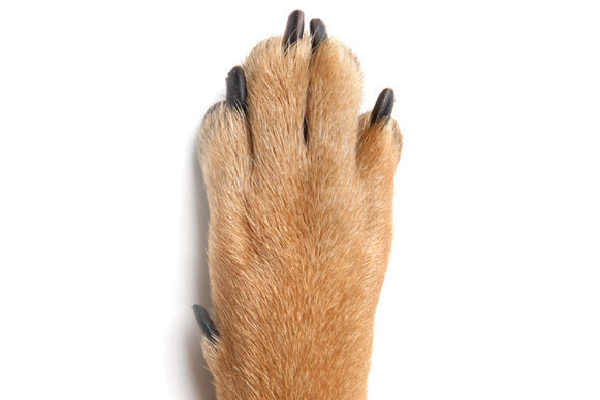 Periodically rinse and examine your dog’s feet.